You're in the midst of a bad day: too many demands on your time, too many crowds, too much of the world. The perfect escape: Yellowstone National Park. And the perfect tools for providing those escapes: webcams. The results of the necropsy on the grizzly bear that killed one and mauled two others in the Soda Butte Campground outside Yellowstone National Park indicates that she was ill and stressed but not baited, providing some vital clues that could certainly explain her condition. Did Photographer Bait Grizzly into Soda Butte Rampage? The folks at the Montana Fish, Wildlife and Parks Department say they're investigating allegations that a photographer was baiting wildlife at the Soda Butte Campground with food in recent weeks, leading them to wonder if that's why a grizzly mother went on a rampage there last week, killing one and mauling two others. The autopsy is in on the mother grizzly who killed one and mauled two last week at Soda Butte Campgound in Cooke City just outside Yellowstone National Park, and the results are pretty dull: she was a little light but otherwise healthy, as experts continue to examine the results of a necropsy to determine whether something physical led the bear to go on the rampage. The three cub bears associated with a deadly killing in Soda Butte Campground just outside the Northeast Entrance to Yellowstone National Park were undernourished and still in their winter coats, according to officials in ZooMontana, providing a crucial clue to why a mother grizzly may have gone on a rampage. Should Killer Griz Been Allowed to Live? For the authorities, putting down a killer grizzly responsible for a Soda Butte Campground rampage was a no-brainer: any time a bear kills euthanasia is virtually automatic. But a surprising number of Internet commentators wanted to see the bear live -- though, as one official pointed out, the farther away they are from Cooke City the more likely they are to argue for clemency. It was a somber week in Yellowstone National Park and surrounding areas, with multiple deaths and losses on the record, some tragic, some part of everyday life. On the plus side, it was the week where the Beach Fire was totally contained and Vice-President Joe Biden gave some inspirational remarks to Park workers. Here's the list of the most popular new stories on Yellowstone Insider the past week, as ranked by page views. The three bear cubs whose mother tore through Soda Butte Campground just outside Yellowstone National Park earlier this week, killing one and injuring two, will be sent to ZooMontana as soon as possible, destined to live the rest of their lives in captivity. Think of it as life without parole. 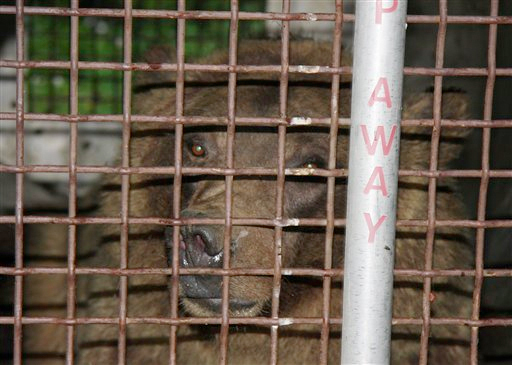 A captured mother grizzly was put down this afternoon after DNA tests determined she was responsible for a deadly rampage through the Soda Butte Campground in Cooke City that left one dead and two injured; the fate of her three cubs still needs to be finalized. The third bear cub associated with an attack at the Soda Butte Campground Wednesday morning has been trapped, as authorities await the results of DNA analysis to see if a captured female grizzly was the culprit in an attack that left one dead and two injured.